For a well-balanced closet, the classic leopard print is a definite must-have. It’s a no-brainer choice when your outfit needs a little something extra, plus, with the right styling, you can wear it anywhere. Best of all, the print can be incorporated into most looks, via a coat, purse, or pair of pumps! Keep reading for five of the chicest ways to incorporate leopard into your summer wardrobe. We live for a leopard coat, and a lightweight style lets you wear one in summer while still staying cool. It’s the epitome of sporty-chic outerwear. This coat can take you from season to season. Wear it with skirts and dresses in the summer, and layer it with leather jackets and vests in the colder months. A simple and thin leopard button-down top or camisole is the ideal way to sneak some print into your look. We love the effortless look and feel of this diaphanous Equipment top. Wear this with leather or denim (or both) in place of your usual white or black tank. 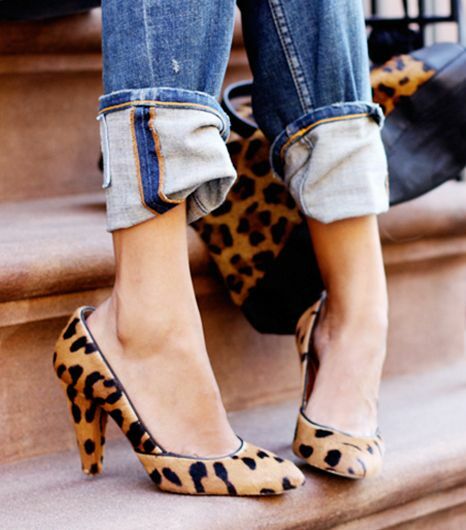 Leopard shoes will never go out of style, so you might as well invest in them now! Plus, they’re perfect for pairing with simple separates for an everyday outfit, or printed pieces for a high-impact look. A slingback sandal will instantly elongate your legs. Swap out your basic black booties for a leopard pair to take your day-to-day outfits to the next level. A light-colored animal-print skirt is perfectly appropriate for warmer weather, especially daytime dressing. This luxe midi skirt would look amazing with a simple white tee. We love how this predominately gray skirt has the ability to act as a neutral, yet still make a statement. The leopard bag comes in all shapes and sizes, so feel free to go wild with this one! We love a good hands-free crossbody bag! This small bag is perfect for keeping in your day bag, and then wearing out at night.